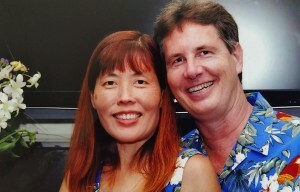 Paul and Kiki Stuart are a husband and wife team who live in Hawaii on the island of Oahu and are world travelers, going each year on two extensive vacation trips with each being over at least one ocean and a number of shorter excursions as well. They have been to Italy five times and decided to share their last trip with readers in their recently published book, Paul and Kiki’s Guide to Vacationing in Italy. Inspired by the enthusiastic responses from their readers, they are now working on two more books in their travel series, one on vacationing in Thailand and one on vacationing in New Zealand and Australia. Look for the Thailand book to be released toward the end of 2015 and the New Zealand/ Australia book in 2016. While not traveling and working full-time, Paul likes sailing, playing guitar & piano and riding his motorcycle. He’s from the San Francisco Bay Area, and moved to his now home in Hawaii in 2003. He also writes multiple software programs and he has his own website for people who like fortune telling. Kiki is from Thailand. She moved to the U.S. in 1993. She also works full-time and likes cooking, baking, swimming, sailing, and of course traveling. We were first inspired to write our travel guide series by our friends, Michael and Martha Love, who write under a pen name The Silver Elves. We have taken them with us on some of our vacations. Since they are authors themselves, they encouraged us to write these books to help others like themselves who are not seasoned travelers to plan their vacations. Once we published our first book on vacationing in Italy and had such great response from readers, we became further inspired and decided to write a series of travel books. We use an outline, which is the first thing we write down. Since we are writing our books as a team, we take turns filling in the pieces. Writing is very detailed and time consuming, but it is worth all the work when you get feedback from readers that your book helped them and that they really liked it. That is important to remember along the way of writing, that you are writing for your readers enjoyment and life fulfillment. We like the idea of being Indie writers and also Print on Demand and Kindle as publishing options. We see Kindle and Print on Demand as here to stay.